2. John Morrell Meat Co.
COMPLEX SAYS: Measuring sausages?! Yeah, we're not sure which is more embarrassing: this ad or the Bengals' record this season. 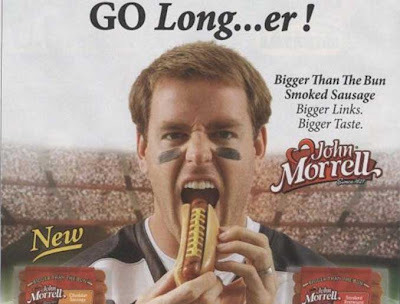 And to think, this wasn't the most pause-worthy part of Palmer's John Morrell Meat ad campaign. B-b-b-b-b-ut wait, it gets worse!